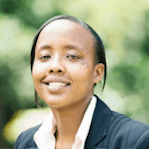 Christine Wanjiru Gachui is a manager in MicroSave’s Inclusive Finance and Banking domain. She is a consultant with over nine years’ experience in retail banking operations, foreign exchange and credit, customer service and marketing and responsible inclusive finance through projects for banks and MFIs in Kenya, Uganda, Tanzania, the Democratic Republic of the Congo, Ghana, Mozambique and Indonesia. Her work focuses on strategy development, market research and product development, formulation and refinement of banking operations and responsible inclusive finance.